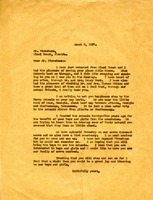 Letter to Mr. Firestone from Martha Berry informing him that she has just returned from Miami Beach, where she saw his house. She informs him that Miss McDavis took her through and that she felt like stopping and talking to him because she feels like she knows him through their mutual friends, Mr. and Mrs. Henry Ford and Mr. and Mrs. Thomas A. Edison. She asks him to visit the schools on his way up north. She informs him about the schools as well, stating that she founded them twenty-five years ago for poor boys and girls, while also giving him the aims and goals of the schools as well. She informs him of their splendid forestry and bird sanctuary. She also informs him that she met Raymond Firestone but that he would not remember her but that she hopes he would bring the boys on a visit to the schools.